Ranbir Kapoor's mother posts a beautiful picture of her son with Alia Bhatt and writers a beautiful caption. Veteran actress and Ranbir Kapoor‘s mother Neetu Kapoor has posted a beautiful picture of her son with Alia Bhatt from last night held Filmfare Awards 2019. Seems like the actress has been gushing over the picture of Ranbir-Alia much like all of us. It’s a picture in which the two lovebirds are looking at each other while on stage with their respective Best Actor trophies. Ranbir won the Best Actor trophy for his performance in Sanju while Alia bagged the Best Actress trophy for her performance in Raazi. The two stars also made their relationship official at the event. 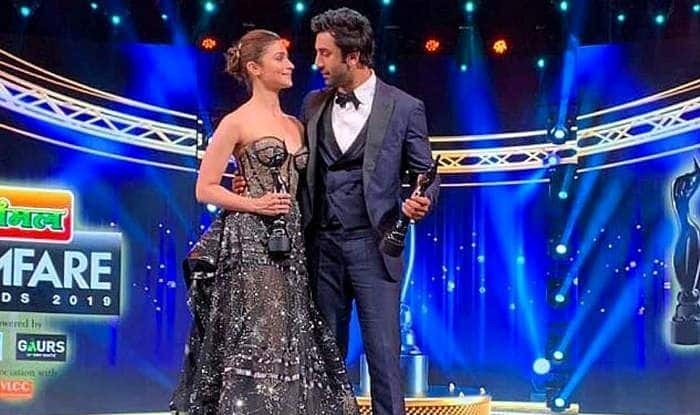 When Alia went up the stage to receive her trophy, she started her speech by thanking everyone but concluded it by saying ‘I Love You’ to Ranbir as the actor gave sweet shy expressions. And Neetu made sure she is making things more official by giving her love and blessings to the couple. Alia and Ranbir have a film releasing soon. They will be seen paired opposite each other in Dharma Productions’ Brahmastra, directed by Ayan Mukerji. The film also features Amitabh Bachchan, Mouni Roy, Nagarjuna and Dimple Kapadia among others. It’s slated to hit the screens on December 20 this year. Alia, especially has got a stunning lineup of films in her kitty. Apart from Brahmastra, she has got Kalank releasing next month. Alia has also recently signed two mega-budget films – RRR with SS Rajamouli and Inshallah opposite Salman Khan with Sanjay Leela Bhansali.